Many people who love animals have pets that have been rescued in some way. But those same people often say that they are the ones being rescued. There’s probably not a person on the planet who has not seen or heard a story about a dog or cat that was so cherished by their adoptive humans that the pet was loved like any other member of the family. And when the sad day comes and the beloved pet passes away, the loss is tremendous to the human family left behind and a real mourning process ensues. Many of us experience this ourselves and have our own stories to tell. In fact, some people prefer to be with their pets than with other human beings. And how could you blame them? Pets don’t judge; they love unconditionally; they forgive; they greet you at the door; they’re loyal like the mafia, and they think you’re the greatest person that ever lived. On top of all that, they’re cute! These are but a handful of reasons our pets rescue us. And for some pet owners, to say they were rescued by their pet can be quite the literal statement. Franny Gerthoffer, executive director of Hilton Head Humane Association, has heard many amazing stories of pets saving their human families through the years of her tenure. “Jasmina, a four-year shelter resident Pitbull, who was adopted by a family in Virginia, saved a life in the literal sense by awakening her family as a building on their property, a compound where they all live, caught fire. The flames had reached the treetops and the entire place would have gone up in flames if Jasmina did not awaken her family. She woke them up jumping off the bed where she sleeps with her owners, running to the window and scratching at the window,” Gerthoffer recalled. Animals that save lives aren’t always family members. For example, dogs can be trained to detect cancer, and some of them can do it better than lab tests. Although it took us humans thousands of years to figure this out, dogs not only have a powerful sense of smell (they have 300 million sensors in their noses, while humans have 5 million), they have a two-part smelling system that allows trained dogs to detect cancer’s unique odors, called volatile organic compounds. If you’re looking for more science to prove that animals save lives, look no further than a recent study, released in 2017, by Scientific Reports, that showed a clear correlation between owning a dog and living a longer, healthier life, especially for people who live alone. To study the link between dogs and longevity, researchers at Uppsala University in Sweden reviewed national registry records of 3.4 million Swedish men and women, ages 40 to 80. Sweden turns out to be a wonderful place to do this kind of study, because dog ownership registries are mandatory there, and every visit to a hospital is recorded in a national database. The key findings of the study included lower risk of death due to cardiovascular disease for dog owners compared to non-dog owners and the difference was especially pronounced when comparing people who lived alone with a dog. Although the study did not point out a direct cause-and-effect relationship between dog ownership and reduced risk of death or cardiovascular disease, it did show the real possibility that dog ownership can help humans in two ways: 1) dogs give their owners a purpose, and 2) they keep them active. About the correlation to physical activity, the more active the dog, the more positive the impact on the owner’s health. This is because these dogs need more exercise than other breeds and their owners typically join them in the activities. Other studies have shown that pets can increase human longevity for the simple and valuable reason of reducing stress in their owners. And other reports have revealed that growing up with a dog in the house can decrease allergies and asthma in children. 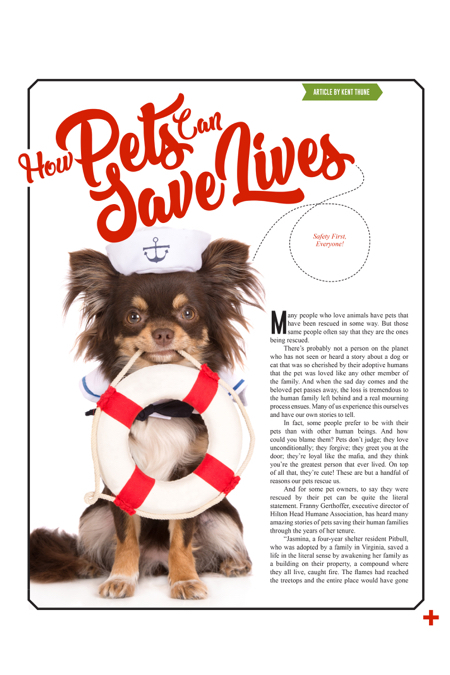 Of all the reasons that pets can save lives, the most common response from pet owners point toward meaning and purpose, although they may not iterate this reason explicitly. Bringing science back into this perspective, Abraham Maslow’s famous hierarchy of needs model demonstrated that the basic physiological needs for humans are food, shelter and clothing. But once these needs are met, human beings truly are fulfilled when their needs of safety, love and self-esteem are met. If these higher needs are not met, people may feel as if something is missing. Kent Thune lives with his animal-rescuing wife, Angie Beyhan Thune, their two pet-loving sons, and their four cats and one dog. When he’s not spending time with his family and pets, he’s working on his writing or advising clients of his Hilton Head Island firm, Atlantic Capital Investments. You can follow his musings on mind, money and mastery of life at TheFinancialPhilosopher.com or on Twitter @ThinkersQuill.